Merchants Bonding Company™ has opened a new contract underwriting office in Phoenix that will serve the state of Arizona as well as the Las Vegas metro area. 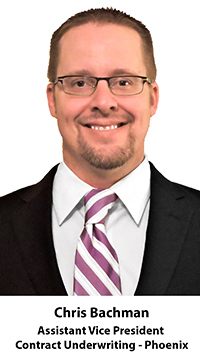 The office will open March 2, 2015 under the leadership of Merchants’ new Assistant Vice President Contract Underwriting Chris Bachman. Bachman comes to Merchants after 17 years with Travelers Bond in Phoenix, including the past 11 years as the Managing Director. Bachman is a 1995 graduate of the University of Northern Iowa with degrees in finance and economics. “I am grateful for my many successful years at Travelers and for the people I’ve had the privilege of working with in the organization. I am also looking forward to this new challenge and the exciting growth opportunities with Merchants Bonding Company,” said Bachman. The addition of the Phoenix office is the latest in Merchants’ expansion over the past five years. Merchants opened offices in Dallas and Seattle in 2010 and in Kansas City in 2014. Merchants is also constructing a new corporate headquarters in West Des Moines, Iowa, which will be completed by the fall of 2015. Merchants Bonding Company was founded in Des Moines in 1933 and is led by fourth generation family members today. Over the past five years Merchants Bonding has grown from the 20th to the 15th largest surety bonding company in the United States with an A.M. Best Rating of “A” excellent or better for 56 consecutive years. Merchants Bonding has offices in Des Moines, Iowa, Dallas and Austin, Texas, Seattle, Washington, Kansas City, Kansas and Phoenix, Arizona.